An ever-so-slightly late post today! In my last outfit I mentioned I bought my 1920s style dress at a fair in Wells, so here's the photos from the event as well. On the 3rd October, I had my first stall for Peppercorn Vintage, which is all very exciting in itself. The event was hosted by Sara from Vintage Somerset in Wells Town Hall, and not only Sara but every other stall holder I spoke to was really lovely and welcoming, despite my initial nerves! It was a fun day for everyone who visited (as well as for us sellers) and after a little while behind the stall I started to love chatting to everyone about the items and the stories behind them. Each stall was filled to the brim with curiosities and unique items, there was a huge variety on offer- it was so difficult not to buy every pretty thing in sight. Next to me was the lovely Kim from Kim Woods Yarns, who had this super colourful stall with an array of vintage goods. She is also very talented and makes crochet stool covers, cushions, and even had some knitted items like this quirky strawberry teapot cosy. Also next to me was Lois from Wells Trading Post who was dressed impeccably in her red shirt, Martini circle skirt with red peripatetic and a matching hair clip. 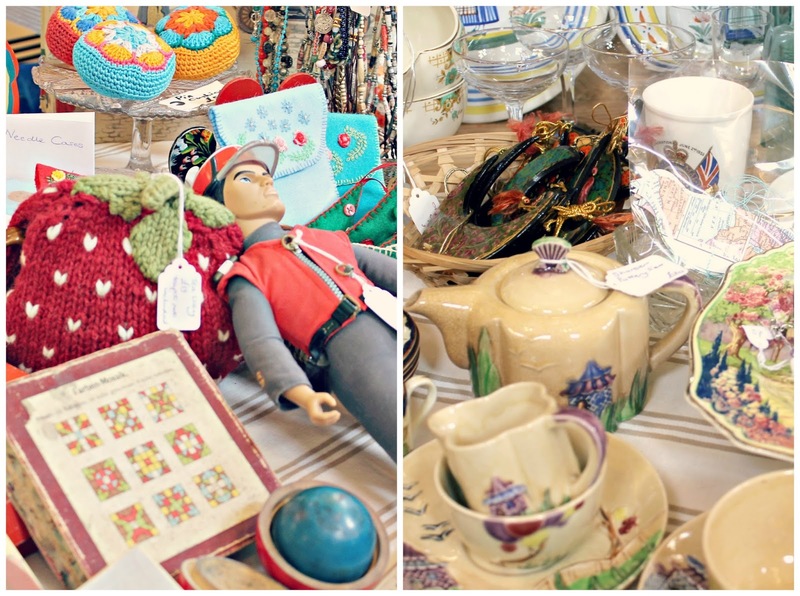 She had plenty of gorgeous vintage clothes on offer and quirky games and trinkets. If you're are near Wells or find yourself passing through, do pop into the shop on West Street because I'm certain you'll find something you love! I hope you've enjoyed my little insight into the fair, for the full list of stall holders and more information about the event, have a look on Vintage Somerset's Facebook page- there are plenty more interesting shops to discover! Oh, how lovely! I'm in love with the little silver spoons in the corner of one of your photos - something so charming about them! Oh how I love vintage fairs! Looks like you had lots of fun! Thank you Evie, it was a lovely day!